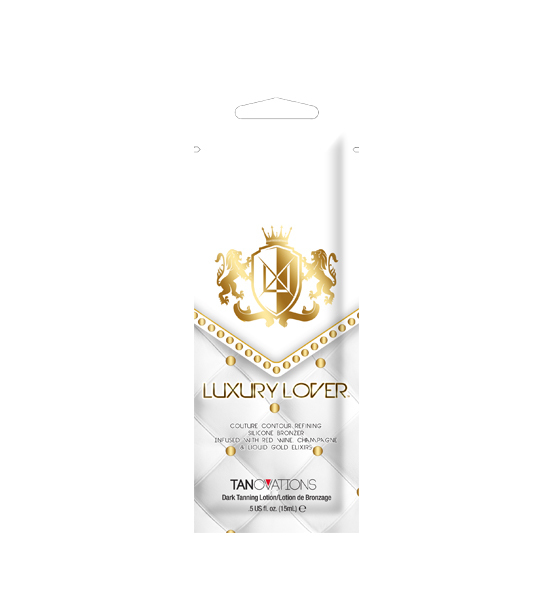 Luxury Lover™ is a one of a kind, hand crafted tanning cocktail. Silicone emulsion will soften the skin while Champagne and Red Wine extracts provide skin-protecting antioxidants. Added Liquid Gold Oil is rich and essential in helping improve skin’s elasticity. For lust worthy results, don’t be like the rest of them darling... Demand luxury. • Luxurious levels of transfer-resistant DHA bronzers for maximum results. • Red Wine & Champagne Infusion – Super fruit anti-aging antioxidants that fight free radical damage. • Liquid Gold Elixir – Rich in essential vitamins to improve skin’s elasticity. • Electric Daisy™ – Flower derived to promote skin firmness, perfect skin contour, shrink pore size, and combat the signs of aging. • Quad Tyrosine Blend + MelanoBronze™ - Stimulates and increases melanin formation to accelerate the tanning process. • C5 Technology – Lightweight, silky-smooth skin conditioner that helps lock in skin’s moisture and tanning results while creating a breathable barrier on skin. Also adequate to use for ultimate sunless absorption. • Melactiva™ – Melanin synthesizer for darker, longer lasting results. • Nouritan™ – Stimulates tyrosine activity and promotes an even and long lasting tan. • Body Fit™ – Reduces the appearance of cellulite and promotes firmness. • Tattoo & Color Fade Protector – Prolongs the life and radiance of your tattoos and tanning results. Copyright Ultraviolet Resources International. All Rights Reserved.